Emily Gertrude Griffiths passed away January 30 at the age of 96. She was predeceased by her husband, Frank A. Griffiths. She will be remembered for having loved deeply and cared fiercely for her family, friends and community. This included, but was not limited to, her passionate support of the United Way, the CKNW's Orphans' Fund and the Canuck Place Children's Hospice. 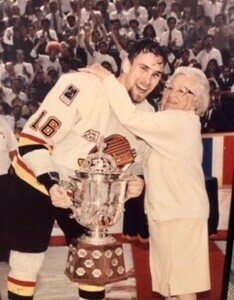 With a smile on all our faces, she will also be fondly remembered for her unwavering support of her beloved Vancouver Canucks. Go Canucks Go! She is survived by her loving family, son Frank Jr., daughter Mary (Klaus) Priebe, son Arthur (Jane), daughter Emily Griffiths (Paul) Hamilton: 16 grandchildren Vanessa (Mahir Agzibuyuk), Frank Andrew (Meagan), William (Rima Martinez), Kevin and Daniel Griffiths: Peter (Sarah) Priebe, Monica (Nelson) Bradshaw, Katherine (Nathanael) Mills, Robert Priebe: Stirling (Angela) Griffiths, Simon (Megan) Griffiths, Emily Anne (Travis) King, Christian and Camille Griffiths: and David and Brandon Hamilton: and 12 great grandchildren Teo and Rose Agzibuyuk, Frank Dylan Griffiths: Sophie Priebe, Charlotte, Elizabeth and Julianna Bradshaw, Genevieve Mills: Remington, Weston and Theodore Griffiths and London King. At her request, there will be no memorial or funeral service held. It was her wish that in lieu of flowers, donations to Canuck Place would be greatly appreciated.